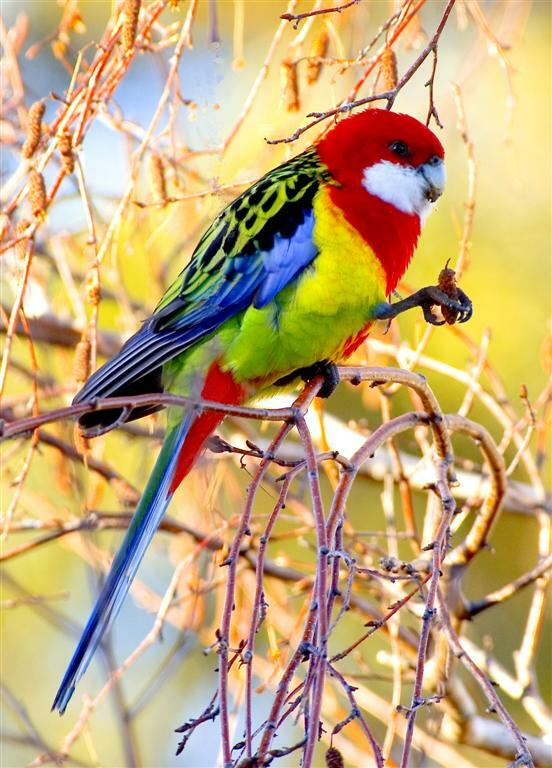 Birds in Tasmania: Declining Rosella? There has been some debate in Tasmania recently, on the subject of whether there has been a decline in Eastern Rosella numbers. In my suburb of Bellerive the numbers seem to have been pretty static for years, although the numbers are only of the order of perhaps 10-15 birds. Certainly they breed in the coastal strip here, although I rarely see any obviously young birds. Michael Sharland, writing in 1945 in his Tasmanian Birds, mentions flocks of upto 20 birds being not uncommon in the Cambridge area. Flocks at the Hobart Airport (near Cambridge) and on the now defunct golf course there, frequently number 60+ during the Winter months, indicating that in places they are more than holding their own. It has been suggested that competition with the introduced Common Starling for breeding sites may have caused a decline in numbers. Perhaps the decline is more noticeable in farming areas. I can remember my first sighting of an Eastern Rosella on my arrival from England, a lifetime ago now. It was my first sighting of an Australian native species that I could identify--it predated field guides-- but the vivid colouration suggested it belonged to a more exotic place. Although we tend to take Easterns for granted these days, it would be a sad day if they disappeared from the suburbs. I have found that the local Rosellas are surprisingly difficult to approach and I rarely get close enough to get a reasonable shot. The accompanying image was taken over the weekend a short distance from my home. This bird, one of three, was feeding on Silver Birch catkins, a favourite Winter food. We certainly see lots of Eastern Rosellas around the Domain, and North Hobart, though having only lived here for a bit over three years, it's hard to say whether these numbers seem to be changing.